ERMES produces a complete range of communication systems Over IP with SIP or Peer-To-Peer protocols: intercoms, emergency call boxes, emergency call pillars, public address, paging. 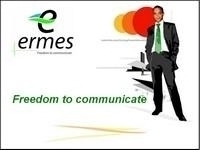 ERMES is an Italian manufacturer of audio communication systems Over IP with SIP and Peer-To-Peer protocols. This range of apparatuses includes intercoms, emergency call boxes, public address, paging systems, audio and video door phones which uses the LAN to transmit the audio as well as the video signals and to control the entire system. ERMES started its activity in 1990 when a group of highly motivated and well-experienced people decided to start the production of electronic apparatuses (switchers, matrices, multiplexers, digital video recorders) and camera housings for CCTV. To day ERMES continues the production of camera housings for CCTV suitable to be used in standard CCTV system as well as in industrial CCTV systems that require cooled camera housings or corrosive environments resistant camera housings. Within 2005 ERMES discontinued its range of CCTV products and changed completely its mission: ERMES started to develop and to produce a new family of audio and audio/video communication equipment Over IP that uses exclusively the LAN (Local Area Network) to transmit the voice, the video and the control signals of the systems. These systems are very easy to install and do not require to lay cables for its specific use: in fact they use only the Ethernet LAN to connect the apparatuses. Moreover they can share the LAN with other systems because they are TCP/IP compliant and can work with SIP or Peer-To-Peer protocols. To day ERMES is the benchmark in the market of the communication systems Over IP where it is present with IP native apparatuses that, thank to the use of the Peer-To-Peer communication protocol, make easy the designing, the installation and the maintenance of the audio and audio/video systems Over IP.